Figure 1. Quasi-binary phase-diagram Nb9-C. Figure 2. Nb9-powder with different additions of carbon. a) Powder grain without added carbon, b) HIPed without carbon; c)-h): with 0.25 (c), 0.5 (d), 0.75 (e), 1.0 (f), 1.4 (g) and 2.8 (h) mass% C. All except a) were heat treated at 1100°C for 30 min and then quenched in water (g quenched in oil). Figure 3. 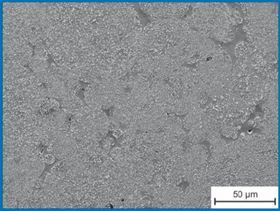 Microstructure of Nb14 with 2.35 % C, austenised at 1100°C, quenched in oil. As long as companies manufacture steel or research is sponsored to improve current methods and find ground-breaking advances in technique, there will be arguments over which way offers the best path to achieve a desired result. That was amply demonstrated at last year's Euro PM 2008 Conference and Exhibition in Mannheim where speakers put forward for consideration their work and methodology in developing steels for use in tooling and other high stress applications. There were many potential candidate papers, some of which will be looked at in forthcoming issues. But in the area of diffusion alloying one paper that took the ever-perilous path of claiming novelty for its methodology caught the eye, and contrasted with another that claimed to be the economic organic-bonded alternative to diffusion alloying. Materials technology research led by Professor Werner Theisen at the Ruhr-University Bochum produced Diffusion alloying – a new manufacturing method for tool steels, a paper that told the story of plotting a way round the natural tendency of super-hard carbides to precipitate from the melt at high temperatures. The route chosen was one that made high-niobium (in excess of 15% by mass) stainless cold-work tool steels – claimed to be a new production route. Tool steels that are used for plastic processing must withstand wear as well as corrosion. This makes high demands on alloy design. For while in order to provide sufficient corrosion resistance it is necessary to have a high amount of chromium (> 12 mass%) dissolved in the iron lattice; however, by paradox, in wear-resistant steels chromium is also used as a carbide-forming element. And bound-in carbides cause chromium to lose its positive effect on corrosion resistance. Efforts have been made to raise the chromium content so that it is sufficient to form carbides and provide corrosion resistance (eg X90CrMoV18). Another possible way is the addition of elements that show a higher affinity towards carbon than chromium. The intention is to stimulate the formation of other carbides leaving chromium in the matrix. To try to stimulate chromium-alternative carbides, metals such as titanium or vanadium are often added to form hard MC-type carbides. In this field several PM materials are available (eg Böhler M390, CPM S30V). Niobium is also a candidate for the role, since it also forms MC-carbides. In contrast to VC, the NbC are relatively pure and in particular their solubility for chromium is very low. This makes Niobium an interesting element for the design of new corrosion and wear-resistant steels. This concept has already been successfully used in cast alloys (eg RN15X) with niobium contents of up to 5 mass%. However the large size of the primary NbC limits the maximum amount of niobium in wrought alloys to about 6 mass%. Powder metallurgy has been established as a valuable production route for decades and efforts have been made before to use niobium as a carbide former in PM steels. Nevertheless, at higher contents, the low solubility of niobium in the steel melt leads to early precipitation and rapid growth of NbC in the tundish which clogs the nozzle and thus prohibits the atomisation of the powder. Wang and Hackl introduced the idea of atomising carbon-free (Wang) and carbon-reduced (Hackl) melts and subsequently add nitrogen by nitriding the powder. A new technology to add carbon has been suggested by Schneiders et al. Here powder with low carbon content is blended with graphite. During a subsequent HIP-process the graphite dissolves and the carbon distributes into the metal powder. By applying this technology, it was possible to carburise X40CrMoV5-1-powder into X100CrMoV5-1 steel. Other experiments showed that it is also possible to carburise a 5%-Nb-powder in order to produce a cold-work tool steel containing NbC in a martensitic metal matrix. Three melts were atomised in a nitrogen-gas stream, containing 9 mass% Nb and 14 mass% Nb, between 10–15 mass% Cr and 1–2 mass% Mo. After atomising, the powder was screened and the size fraction +250 μm was discarded. The remainder was blended with graphite powder in a grain size of 1–2 μm. The intended carbon contents are given in Table 1. They were verified using a spark spectrometer type OBLF QSG750. The results are also plotted in Table 1. Blending was performed in a tumbling drum blender for one hour. Next, capsules made of stainless steel were filled with the powders, evacuated and sealed. The sealed capsules were hot isostatically pressed (HIPed) for 4 hours at 1150°C under a pressure of 100 MPa. Table 1. Used powder blends with the target C-contents as well as the results from spark spectrometry. After compaction, samples were cut out of the capsules and hardened. Thereafter the material was austenitised at 1100°C for 30 minutes and then water-quenched to room temperature. Next they were mounted in electrically conducting epoxy and ground and polished to mirror finish. The prepared samples were examined using a scanning electron microscope of the type LEO 1530 VP. Prior to the metallographic examinations, the commercial software ThermoCalc (in combination with the database TCFE4 ) was used to examine the alloys to determine the phases present in equilibrium as well as the phase compositions independent of the temperature and the amount of added carbon. 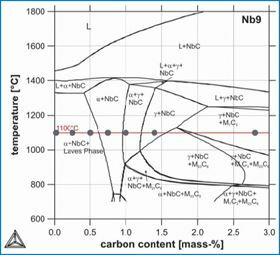 Figure 1 shows the quasi-binary phase diagram in equilibrium for the alloy Nb9 with carbon contents between 0 and 3 mass%. Since the solubility for niobium in the iron-rich matrix is low, the intermetallic Laves-phase is stable for low carbon contents. This C14-type cubic phase is basically of the constitution NbFe2. Although it shows a certain solubility for chromium, most of the latter remains in the matrix and stabilises the ferritic lattice up to the liquidus temperature. With increasing carbon content the Laves-Phase disappears and a face-centred cubic niobium monocarbide (NbC) is present. As stated before it remains relatively pure, dissolving small amounts of molybdenum but nearly no iron or chromium. Since the NbC consumes virtually all carbon and no chromium the matrix phase remains ferritic until all niobium is bound in NbC. Above a certain content carbon is then diluted in the matrix and stabilises the austenite above 800°C. At a content of about 1.4%C a phase field exists where only austenite and NbC are stable. At higher contents, carbides of the types M23C6 and M7C3 are precipitated. These carbides contain high fractions of iron, chromium and molybdenum, thus leading to a decrease of the contents of the latter two elements in the matrix. Normally, phase diagrams are used to keep track of the phase formation during cooling and thus are read along vertical lines. In contrast, the Ruhr Bochum team investigated the phase formation that occurs during the carburisation of the metal powder during HIP. Therefore, samples with different graphite contents were HIPed (compare Table 1). The positions of the samples used at the annealing temperature of 1100°C are also marked in Figure 1. Hence, below the phase diagram will be read along the horizontal line at 1100°C. Prior investigations revealed that for austenitised samples after quenching austenite is of course transformed into martensite (if it does not remain as residual austenite). Non-metallic inclusions however – such as carbides and nitrides – are not affected if the temperature rate is sufficiently high. Thus the phase diagram at high temperatures gives information about the non-equilibrium state of the samples after quenching to room temperature. 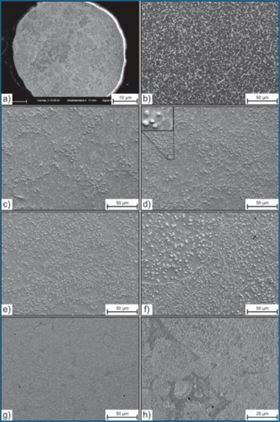 Figure 2a shows the microstructure of the Nb9-powder in the atomized condition. It consists of fine lamellar Laves-phase precipitations in a ferritic metal matrix. The intermetallic phase changes its shape towards a more blocky structure during the HIP process if no carbon is added (Figure 2b). Figure 2c shows the situation after the addition of an amount of graphite that leads to a carbon content of 0.25 mass% in the material. As the diagram (Figure 1) predicts, both Laves-Phase and niobium carbides are present. These carbides are located along circles with diameters between 10μm and 100μm. Obviously this is due to the precipitation starting at the former surfaces of the spherical powder grains while the inner areas of the former grains still show Laves-phase which is unaffected by carbon. Since no graphite was detected after HIP it seems to be completely dissipated and dissolved in the metal matrix or bound to carbides. With increasing carbon content, the precipitations invade deeper into the powder grains while the unaffected areas in their centre become smaller (Figure 2d + e). The NbC always precipitates on the boundaries between Laves-phase and matrix and then grow into the Laves-phase, as can be observed in the magnified part in the upper left corner of Figure 2d). At 1 % C the Laves-phase has vanished and the microstructure shows a dispersion of fine (< 5μm) MC-type carbides. The carbide size corresponds to the size of the former powder grains (Figure 2f)). In contrary to lower carbon contents, at 1% their boundaries are closely occupied with carbides. The observation that 1%C is necessary to transform all Laves phase into NbC is not in complete accordance to forecasts based on the ThermoCalc-calculations because the diagram predicted a Laves-phase-free structure already at 0.75%C in equilibrium at 1100°C. In order to obtain a martensitic hardenable matrix, 1.4%C have to be added according to ThermoCalc calculations. The correspondent microstructure is shown in Figure 2g). Compared to the previous photographs this sample shows smaller (<1 μm) carbides which sizes seem to be independent of the size of the powder grains. Contrary to Figure 2f) there is no carbide accumulation on the grain surfaces. Instead there are carbide free areas which can be identified as the former interstices between the powder grains. Only a small part of these interstices remain carbide-free, though. The other zones show an extremely fine dispersion of NbC and in accordance with the calculations no chromium-rich precipitates. The basic idea behind the technology of diffusion alloying is the complete transition from graphite to carbon that is dissolved in the metal matrix or bound in carbides. While the equilibrium state for the used alloys does not show any graphite, it has not been clear that this equilibrium would be reached by adding the stable graphite phase to an iron-based powder. The results show that this is possible even at very high (2.8 mass%) carbon contents. Even at high NbC-contents, the carbides are dispersed in the metallic matrix and show no tendency to form networks that would severely diminish the materials' toughness (see Figure 3). The predictions of the ThermoCalc-calculations in equilibrium are in good accordance with the experimental results as the microstructures of Figure 1 and Figure 2 show. Additional EDX-measurements of the contents of both chromium and molybdenum in the metal matrix that are not presented in this paper also match the calculations and thus support the reliability of the latter. At 0.75%C however, calculation and experimental results seem to deviate from each other, because Laves-Phase was observed but not predicted. There are two possible explanations for this discrepancy. At first the assumption that the as-quenched state equals the equilibrium state at annealing temperature is not necessarily valid for intermetallic phases like Fe2Nb. In case of the 0.75%C specimen, the Laves-phase is stable below 900°C. Thus, if at 1100°C only NbC and ferrite would have been present, it is possible that NbC reconverted into Laves-Phase during cooling. Secondly, according to ThermoCalc, the C-content of the monocarbide is sub-stoichiometric for low alloy-contents of C. Since at these low contents the carbon is not distributed equally over the former powder grains, which is obvious because of the unequal distribution of the carbides, this may not be the case in the specimens. If the C-content in the NbC is higher than expected, more carbon would be necessary to transform all Laves-phase and thus the latter would be stable up to higher C-contents. However, the intended carbon content for the use as tool steels is about 1.4% and at this point, the named assumption was shown to be appropriate (Figure 2g)). Furthermore at this point ThermoCalc predicts stoichiometric NbC. Thus the deviance is not critical for the technical use of the alloys. Concerning the size and the distribution of the NbC in alloys based on the Nb9-powder, there is a difference between alloys containing less and those containing more than 1% carbon, as can be seen in Figure 2. In the former case, the carbon content is not sufficient to transform all Laves-Phase. The distribution of carbides is not uniform since the carbon intrudes each single powder grain from the outside. It does not diffuse deep into the powder grain but rather forms carbides close to the surface. If the niobium in these regions is consumed however the carbon diffuses towards the centre of the former powder grains to form more NbC instead of forming chromium-rich carbides close to the surface. The fact that NbC always precipitates on the boundaries of Laves-phase particles can be explained considering the different diffusivities. Carbon as an interstitial element diffuses much faster than the large substituted niobium atom. Thus, the carbide will be formed at sites of augmented niobium-concentration, ie on the Laves-Phase. The location on the boundary can easily be explained by the interfacial energy which facilitates the nucleation. Above 1% C two main changes occur: The size of the carbides is much smaller than below 1% and NbC-free interstices between former powder grains occur. To explain these two incidents it is important to recall the three processes that happen simultaneously during HIP. First, the fine-lamellar structure of the Laves-phase that develops during the atomisation changes to a more blocky structure during HIP if no carbon is present as Figure 2a) and b) show. Second the graphite dissolves and the carbon diffuses into the metal. At this point the mechanism for the graphite transition is not identified. Earlier research  lead to the assumption that a Boudouard-equilibrium is established that promotes fast carbon transport via the gaseous CO-phase. Coupled to the carbon diffusion into the material is the precipitation of NbC at the Fe2Nb-boundaries. The third process is the compaction of the powder to a dense material. Here, both deformation of the material and densification by sintering of the metal powder play a role. If the carbon transition and diffusion rate is now sufficiently slow providing sufficient time to the Laves-phase to be able to spheroidise and grow the carbides become relatively large. If the transition occurs at a higher rate, carbon will reach the Laves-phase earlier and thus the carbides are finer. This seems to be the mechanism at higher C-contents. The high rate at which the graphite transition presumably occurs also explains the NbC-free areas: The interstices between the powder grains are filled by sintering which is a diffusion-controlled process. Since only single-atoms are able to diffuse into the interstices the precipitated NbC would have to decompose into niobium and carbon. Due to the high affinity between the two elements, decomposition of NbC does not happen in the solid state, though (see Figure 1). Below solidus the NbC-content is invariant in respect of the temperature and in presence of carbon no niobium is dissolved in the matrix that could diffuse towards the interstices. This is not true for the carbon-free material. Here only about 80% of the niobium is trapped in Fe2Nb; the other 20 % is free. If the graphite content of the powder blend is further increased, the number and size of the NbC-free interstices also increase, which can be explained by a further accelerated carbon transition. In contrast to niobium, the elements that form M7C3 and M23C6, namely chromium, iron and molybdenum are dissolved to a high extent in the matrix. Since these carbides are not stable over the relevant temperature range, precipitation of carbide is possible during cooling and thus after compaction. The high amount of dissolved chromium and the higher diffusivity compared to niobium leads to a larger size of the chromium-rich carbide. Turning from novel processes to methods which are better established, a paper from Canada's Quebec Metal Powders took economics as a major focus. It noted that a large proportion of molybdenum-nickel-copper(Mo-Ni-Cu) steels parts are produced from diffusion alloyed powders, which generally offer unique properties and greater compositional consistency compared to standard powders. However, the general upward trend of prices for alloying elements can make diffusion-bonded powders less attractive to penny-conscious manufacturers. However, almost paradoxically, one result of this study was to confirm that additions of small amounts of expensive molybdenum are cost-effective in terms of sintered properties. There are different ways of producing Mo-Ni-Cu powders. What the authors of Organic powders: a cost-effective alternative to diffusion alloyed powders, set out was two manufacturing routes starting with prealloyed molybdenum steel. What they called the “diffusion alloyed route” consists of an annealing step after the addition of nickel and copper to partly diffuse the elements. It results in excellent alloying element-powder bonding and part-to-part homogeneity. But it is comparatively costly. An alternative is “the binder treatment” route, where a steel powder is binder- treated admixed with all the additives. A modified version of this, called “organic bonding” has been developed by Quebec Metal Powders as a result of the improvement and optimisation of the company's Flomet proprietary binder treatment technology. The organic route consists of binder treating the moly-alloyed steel powder admixed with nickel and copper only. Other constituents are added a later stage after the binder treatment. • A less expensive process, resulting in reduced material cost. Another advantage of organic-binded technology, said the authors, is “its great versatility”. It is, they went on, “very easy to modify the formulation by changing the base powder grade and/or the level and grade of nickel and copper to better meet an application's needs at lowest possible cost ”. An experimental frame using a Taguchi L9 matrix was designed to evaluate four factors at three levels. The factors were Nickel addition (2.5%, 3%, and 3.5%); graphite addition (0.5%, 0.65, and 0.7%); the level of molybdenum prealloyed in the steel powder (0%, 0.5% and 0.85%) and copper addition (1%, 1.25% and 1.5%). • Increasing molybdenum levels from 0% to 0.5% increases the P/C index for transverse rupture strength, ultimate tensile strength and yield strength with no further beneficial effect between 0.5% and 0.85%. So, said the researchers, even if costly, molybdenum is a cost-effective element. • Except for graphite, none of the factors allows increasing hardness in a cost-effective way. The researchers concluded that the results of their experiments showed that a significant gain in density is obtained when using organic-bonded powders instead of diffusion-alloyed types. Molybdenum content had little effect on compressibility, but had the strongest effect on sintered properties and increasing its content is a cost effective way in improving sintered properties. The model developed from this study was used to develop a leaner organic-bonded version of diffusion-alloyed 0.5Mo-4Ni-1.5Cu powder. It was shown that equivalent properties can be achieved with an 0.85% molybdenum steel powder organic-bonded with lower levels of nickel and copper, which, the researchers said, resulted in cost savings of up to 20%. Thisarticle draws on two papers given at the EPMA's Euro PM 2008 Conference and Exhibition in Mannheim. The first is Diffusion alloying – anew manufacturing method for PM tool steels, by Dipl-Ing Stephan Huth and Professor Dr-Ing Werner Theisen at the Ruhr-University in Bochum. The second paper is Organic-bonded powders: A cost-effective alternative to diffusion-alloyed powders, by Sylvain St-Laurent and Claude Gélinas of Quebec Metal.